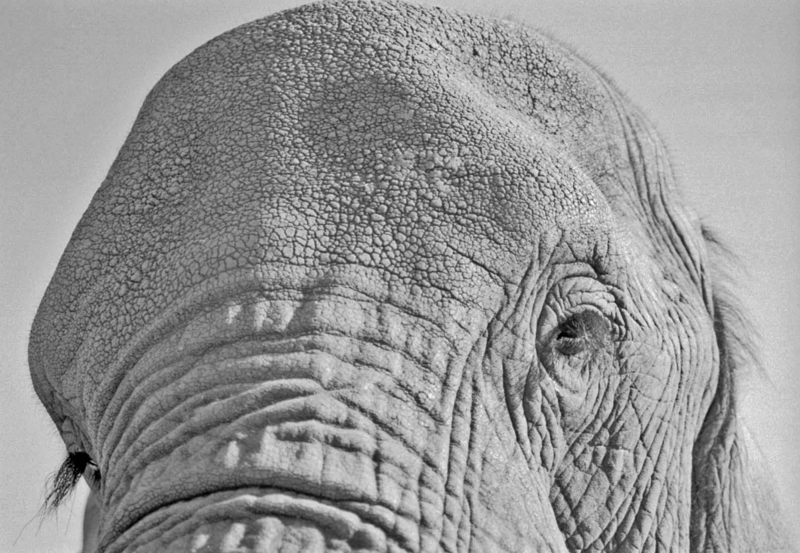 Standing on a termite mound, face-to-trunk with an elephant, I place the palm of my hand against Morula’s fluttering forehead, a forehead as cool and rough as tree bark. She’s burbling, a rumble that resonates like water gurgling down a hollow pipe. She’s also making sounds I can feel, but not hear. Right at the top of her trunk, where her bulging nasal passage enters her skull, her skin pulses beneath my hand, vibrations that reverberate in my chest cavity, drum against my heart. Muscular ground swells of sound roll full and luxuriously out in the bush, bumping into hippos, giraffes, zebras, lions, hyenas, birds, snakes and tsetse flies. But it is only elephants who raise their heads and listen. Most of Morula’s vocalizations are rumbles, which fall partially or entirely in the infrasonic range of 5-30 Hz., throbbing, quaking air for which we humans have no auditory perception. Such low-frequency rumbles usually have harmonics and overtones, both of which can be selectively emphasized. As in whale song, each individual elephant has a signature sound, one like no other elephant – their voices as different from each other as our voices are different from each other. And invisibly, from beyond an island of trees: Yes, I am here. Speech makes us human, makes these marks on this page possible. When we speak, our vocal chords vibrate with forced, small explosions of air from our lungs. We shape words with our mouth and tongue. Expelled from a chest full of wind, words float around us like little clouds, each one a separate exhalation, creating an atmosphere of meaning, thickening language one word after another. Sounds unfold in time, in agreeable waves pulsing against our ears. When we are lost and listening to a piece of pleasurable music, time even suspends itself. Songs hang on our bones. Standing on a termite mound, I close my eyes. The fluttering beneath my hand goes on and on and on. I open my eyes. “MO-RU-LA,” I sing. My voice, like hers, originates in my vocal chords. But my vocal range is barely an octave, limping through the air at 220 Hz. Morula’s range is tremendous, more than 10 octaves, from 5 Hz. To 9,000 Hz. The most athletic human voice in history belonged to Yma Sumac, a Peruvian, who had a self-proclaimed range of five octaves and a recorded range of four and a half. From B below low C to A above high C, from about 123 Hz. to 1760 Hz. Sumac’s high range was the same frequency as an elephant’s trumpet. This is a woman who could occasionally hit a triple-trill and whose voice could sound like an upright bass. Morula would find her vocalizations a lot more fascinating than mine are. Like all elephants, Morula is able to produce low frequency sounds just because she is big. The larger the resonating chamber (think cello compared to violin), the lower the frequency of its sound. Morula also has long and loose vocal chords and a flexible arrangement of bones attached to her tongue and larynx. In addition to her loose voicebox she also has another special structure at the back of her throat called a pharyngeal pouch, which not only affects her low-frequency tones but also holds an emergency supply of water. Morula can produce different results from the same basic rumble by holding her mouth open or shut, by an empty or full pharyngeal pouch, by flapping her ears rapidly or slowly, by holding her head high or low, or by the position of her trunk and the speed of air moving through it. She can combine hundreds of variables to invent thousands of sounds. Imagine a vocal instrument equal parts cello, double bass, violin, tuba and trumpet, one whose entire body is an expanding and contracting resonating chamber, one that can sing with a throat full of water and triple-trill a rumble, a roar, and infrasound, all in one 3-second call. Yma Sumac would be horribly jealous. Straight-armed, I lean against Morula’s forehead. A soothing mantle of high-pitched insect noise drapes over my shoulders. The fluttering beneath my hand has unexpected results. A soft dry scrape makes me look around. It’s Thembi’s ears whisking against her shoulders. She’s standing behind me, on the opposite side of the termite mound. Glancing from one large forehead to another, from one set of eyes and back, I have a feeling Morula and Thembi are waiting for me to do something. Maybe something as simple as rumbling in return.